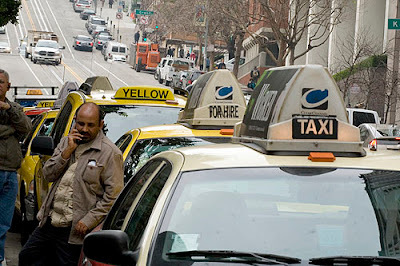 SF Taxi Media: Recap Of The Taxi Advisory Council Meeting, Monday, January 30, 2012. By John Han. Recap Of The Taxi Advisory Council Meeting, Monday, January 30, 2012. By John Han. The Taxi Advisory Council (TAC) voted last Monday on eighteen general ideas to recommend to the SFMTA Board of Directors, (SF Municipal Transportation Agency), to regulate a new, permanent medallion sales structure for the City's taxi industry future. The eighteen votes represent just over half of the items on the voting agenda. Fourteen still need to be voted on. The eighteen already voted on were by a simple show of hands. The items were called one by one, and council members raised hands yielding either an “aye” or “nay” vote for each item. Thirteen of the fifteen council members were present. They were – Barry Korengold, John Lazaar, Athan Rebelos, Dan Hinds, Tone Lee, John Han, Ruach Graffis, Richard Hybels, Tara Housman, Chris Sweiss, David Khan, Timothy Lapp, and Carl Macmurdo. The two council members absent were – Bill Mounsey who represents drivers on the waiting list, and Bill Minikel who represents drivers NOT on the waiting list. Minikel actually, due to moving, no longer serves as a council member and his seat is currently vacant. TAC chairman Chris Sweiss grouped the items into four main categories totaling thirty-two items. Waiting List: Suggestions having to do with distribution of permits to the waiting list or suggestions impacting the waiting list. Operational: Suggestions having to do with how the industry should operate or specifically how medallions should be distributed. Financial: Suggestions having to do with the financial aspects of the industry, sometimes more specifically, how the MTA should or should not financially benefit from the industry. Retirement: Suggestions having to do with possible retirement options for permit holders. So far, all of the items in the first two categories – “Waiting List” and “Operational” have been voted on, totaling eighteen votes. Prior to taking the eighteen votes, one more additional vote was taken. And that was simply for whether medallion sales, generally speaking, should go forward at all. The TAC voted in favor of generally going forward with some version of medallion sales. The lone “no” vote was by Ruach Graffis. It should be noted that all of the votes are to be taken as general ideas as opposed to being taken literally. For example, when the TAC voted in favor of continuing medallion sales, it simply means that some version of selling medallions should go forward. It doesn't necessarily mean that all medallions must become unequivocally transferable, without some able to be given to the waiting list without purchase. Here are the results of the first eighteen items voted on so far. 2.2 [Waiting List] Commit hundreds of medallions to be newly issued to individuals on the waiting list without purchase. 3.1 [Waiting List] Over 2 years issue 100 medallions to the waiting list without purchase and 100 for purchase with graduated discount for the first 100. 5.1 [Waiting List] Allowing medallion buyers to retain their position on the waiting list and sell a purchased medallion once they are eligible for an earned medallion. 5.2 [Waiting List] Pro-rating the medallion purchase price for those on the waiting list based on their time on the waiting list. Purchase price divided by highest number of years on wait list = discount per year. Each person would have their purchase price discounted by number of years on waiting list times discount per year. Transfer fees would be pro-rated. 6.1 [Waiting List] Newly issued medallions and revocations should go to drivers on the waiting list without purchase. 7.1 [Waiting List] Issuing temporary sedan medallions to ramp permit holders who have served the disabled community for 7 years and re-issuing ramped medallions to the bottom of the waiting list. 8.3 [Waiting List] A percentage of medallions should remain non-transferable and issued to qualified cab drivers without purchase. 1.1 [Operational] Number of transferable medallions is capped at 1/3 of total number of medallions. 1.4 [Operational] Once the waiting list is exhaused medallions would be distributed according to A-Card seniority. 2.1 [Operational] All permit holders are allowed to sell. a) Once waiting list is exhausted all drivers with 5 years experience are eligible as buyers. 2.3 [Operational] Lease non-medallion permits to operate to Full-service cab companies on 3 year leases. 6.3 [Operational] All taxicabs should be operated as gas and gates. 8.2 [Operational] Medallions should be issued exclusively to qualified cab drivers. 8.5 [Operational] An elected or appointed board of directors comprised of drivers should manage the driver fund. 9.1 [Operational] Only Single Operator Medallions will be newly issued moving forward. 9.3 [Operational] Ramped medallions will be issued directly to companies. a) Employee drivers will operate ramped medallions. The remaining fourteen items in the latter two categories are as follows. a) $50,000 payment into fund will allow permit holders to auction medallion rather than sell for fixed price. Permit holders pay into the drivers' fund based on the type of medallions they possess. Reduced driving requirement with contribution to drivers' fund for older or disabled permit holders. a) these would be run solely as gas and gate. b) A permanent retirement decision can be made of either eliminating the driving requirement or selling the permit anytime after the age of 65. Allowing a limited number of K permittees to retain their permit without a driving requirement after a commitment to return permit to the city upon death. Ability for K and Pre K permit holders to purchase transfer rights by paying transfer fees in advance. The remaining fourteen items are scheduled for discussion and vote at the next TAC meeting February 13, 2012, at 1pm in the Second Floor Atrium at One South Van Ness Ave, in San Francisco. During the Council Liaison's Report, Jarvis Murray of Taxi Services staff said that a new, second investigator is expected to be hired, "sometime next week" to enforce against illegal limos and taxis. Currently, the agency employes only one investigator. He said that the two investigators would probably combine a mix of dayshift and nightshift enforcement. He added that newly proposed changes to the taxi regulations could mean that "wrap" taxi advertisements would no longer be allowed in the City. What excellent reporting, sir. Thank you very much. It does a real service to those of us who can not be at the many meetings. Always good to hear/read your comments. The people on the list should be honored,it is the noble and right thing to do. If you consider getting your medallion to be the pinnacle of driving a cab then the people on the list have bin denied there peak because of greed and a warped, crooked system. I myself have bin denied my medallion after climbing 90 percent of Mount Everest and have bin left hung out to dry I should have got my medallion two years ago, how many thousands of dollors is that. It makes me sick to my gut, keep the poor man down and then kick him when he's down. I suppose the thousands of dollars were needed for bus drivers bonuses and silly rain shelters. Thanks M T A.